This tart features two of my favorite things. Beets and cauliflower which are brought together by an amazing almond flour based crust. I was inspired by a recipe in the most recent issue of Martha Stewart for a roasted radish tart. It sounded delicious (and a creamy cauliflower base intrigued me!) I decided to give it a radical spin and swap beets for radishes and make it gluten free with an almond flour based crust. The result was a savory tart that was creamy, nutty and absolutely delicious. I hope you all enjoy this recipe as much as we do. It pairs nicely with a simple green salad and a glass of crisp white wine. Melt the butter in a large skillet over medium heat. Add the shallot and cook, stirring often until soften and translucent, about 5 minutes. Add the cauliflower, thyme, salt and pepper, and vegetable stock. Bring to a boil. Reduce heat to low, cover the pan and cook until the cauliflower is very soft, about 8-10 minutes. Let cool slightly. Puree the cauliflower mixture in a blender until smooth. Add the egg and process until well incorporated. You should have about 1 1/2 cups of puree. Toss the sliced beets with a little olive oil and layer them on the prepared crust. Sprinkle with flakey sea salt and bake in the oven until the beets begin to shrivel and the filling is bubbling around the edges, about 35-40 minutes. If the crust seems to be burning before it's done put a little tin foil around the edges. Let the tart cool for about 15 minutes before slicing and serving. Sprinkle with parsley and enjoy. Hi! This looks amazing!! Sorry if this is an annoying sub question, but do you think one could replace the almond flour for oat flour? For this recipe I wouldn’t swap the almond flour out as it’s not a 1:1 ratio with other flours. Looking forward to this one for dinner. We made this…and it we got about 3 cups of puree or so (and it was just right for the tart). how does ONE CUP of filling fill a pie that will serve 6? It fills the pie just perfectly. I hope you enjoy it. And feel free to add more filling if you feel you need it. This recipe yields more filling than you’ll need for the tart. And as always with my recipes, I suggest you make it your own to suit your personal preference. Happy cooking! Thanks for the recipe. I’m a vegetarian. I like the crust. 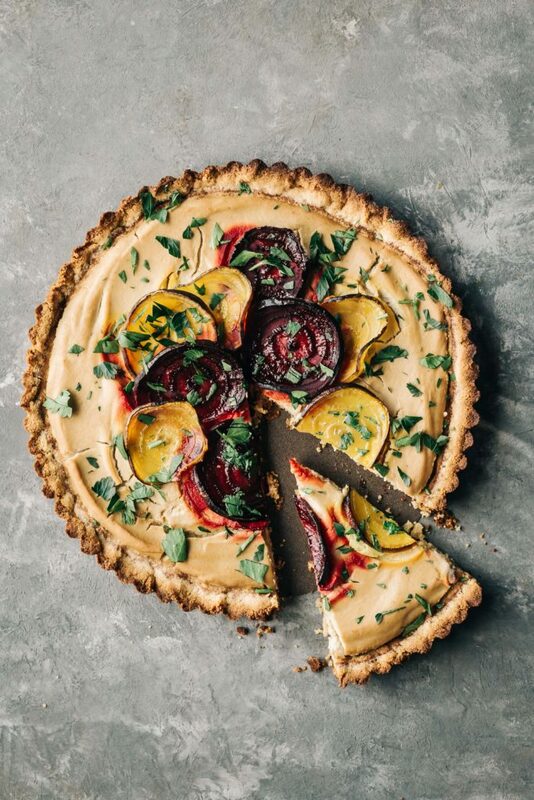 Are the beets precooked and peeled before topping the tart? Nope! There’s no need to peel the beets and they are sliced thinly while raw and cook with the tart. I hope that’s helpful. I made this last night, and it was absolutely delicious! It took me a bit longer to get the cauliflower as soft as I wanted, and I had to add a tiny bit more broth during the cooking process. I ended up with about 2 cups of puree, which was perfect. The filling was so creamy and dreamy! I also used ghee in the crust instead of olive oil, which worked out very well. I think the 2 Tbsp’s of minced parsely was omitted from this “preparation” section of this recipe. I mean, I added it where I thought it should have been and it was super yummy, just, could we please update this recipe JUST in case. I like to follow rules (sometimes, ha). Made this last night, it was absolutely beautiful and delicious. BUT…the crust did not hold together. Even after sitting for 15 minutes, it was just a crumbled mess on the plate. I had pre-baked it for 18 minutes as instructed. Any tips on a fix for this for the next time I make it? Thanks in advance!